As a child, I skied in Glenshee and loved being outside. At 19 I started hill-walking and have happily worn out many pairs of boots since. I especially enjoy hill-walking, long distance trails (the Camino de Santiago across Spain and the West Highland Way several times) and wild camping. Late evening sunsets from high up on a mountain have to be among life’s greatest pleasures. Thankfully, in Scotland, we’re spoilt for choice. Highland Perthshire has lots to offer close to home, but further afield the Isle of Skye has it all; drama, amazing landscapes, fantastic shoreline and caves to explore. I’m passionate about badgers, so I’m on special alert when walking in woodland. I’ve been lucky enough to hike in the Canadian Rockies, Spain’s Sierra Nevada and Nepal. I’d have to say that it wasn’t Nepal (although it was fantastic). For me, my biggest adventure so far was walking the Camino de Santiago across Spain. That’s because I was full of trepidation at the prospect of walking 500 miles in a land I didn’t know. Now I know I can do it, but hindsight’s a wonderful thing! For me, both personally and professionally, knowing something of the history, folklore and colourful characters of an area really brings the landscape alive. I really enjoy sharing these tales with other people and hearing their tales too. Only the Wilderness Scotland blogosphere so far, however one of the blogs ended up in the Chicago Tribune, so I’m happy to claim that as an achievement. See previous note. They were simply superb. They both stepped in at the last minute and were marvelous. Friendly, calm, knowledgeable, they engendered confidence and brought both skill and humor to marvelous hikes. Great personalities, both. Lorraine was with us on our first day, and I found her to be warm, bubbly and compassionate. Will joined us for our remaining days, and I really enjoyed his enthusiasm and sense of adventure. He's always smiling and because of that so are we! I would love to go on another adventure with both Lorraine and Will. PS - on our last couple of days we were joined by a prospective guide, Leoni (sp? ), who was also friendly, fun and a keen outdoor enthusiast. I'd be happy to join one of her tours in the future too! Keep up the amazing work in hiring your guides, they are exemplary people and represent your company beautifully. Gill was amazing. Very knowledgeable and patient. I can’t praise our guide enough! Gil was superlative in all respects. Right from the beginning when one of our group was late, she exuded calm, and bought us all coffee while we waited. Her knowledge was amazing. From the landscape, history, botany, farming and hunting uses of the land to reading us evocative poetry she kept my interest at all times. She did an excellent job of assessing our groups’ varied abilities and never made anyone feel inadequate. We had to ford two large rivers and her calmness and and quiet confidence made even the most timid among us feel able to get across without a dunking! Also, after having driven in Scotland myself for a few days after our walk, I am in awe of her driving abilities too! From the very beginning I felt safe and secure knowing that Gil was in charge. I learned so much about Scotland's great outdoors thanks to Gill's vast knowledge and enthusiasm! I appreciated her energy and sense of humor as well as taking time to point out details about everything from tiny plants to towering trees. I would have missed so much had I been alone. The bits of poetry provided a nice time for reflection during a break. She's also a very proficient van driver which is no small task considering the narrow twisty roads and crowded parking places! Thanks again, Gill, for an in redible trip! Gill was excellent in every respect. A very competent and pleasant leader of the group, who knew the area and the walks very well indeed. She was also a very competent and safe driver - we had full confidence in her. Gill was a wonderful, well read, experienced, kind, knowledgeable and friendly guide. She made us feel included and part of the group, even though from totally different backgrounds. Hayley was a ball of energy, which became very contagious. A free spirit, full of life, experience, wisdom and a wicked sense of fun. Made my trip especially memorable and makes me want to come back and do some more hiking trips. Gil was very experienced, knowledgeable, flexible and kind. Hayley was very knowledgeable on the Lake District and we really enjoyed her taking us on backroads. Both were dynamic and very attentive and adaptable to the group’s needs. Dave was fun, well organized, safety conscious, informed about history, environment and politics; it was a joy learning from him and exploring with him! He provided the perfect blend of spontaneity, flexibility and forward planning. As we approached our destination it felt like there wasn't as much wilderness to explore; the two least interesting hikes were at the end into more populated areas (bikes zooming up from behind constantly) and we were hot and tired and they felt like a let down compares to the magnificence of our early hikes. In retrospect I might have opted for replacing these hikes with more time exploring Edinburg on foot? Sadly, we opted out of the nighttime tour of Edinburg because we were tired and had very early wake up. A dinner reservation at excellent restaurant near hotel would have been great! It was a memorable week of varied walks and experiences. Very soon after I booked last year one of the influential international travel organisations rated Skye as the top place to avoid because it had become so over-visited! I needn't have worried. 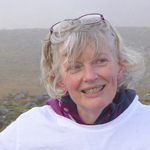 Our guide, Gill McMillan, was very canny in choosing walks and destinations that really did appear quite remote, with only the occasional glimpse of crowds and honey-pots. I cannot rate her highly enough. She was flexible, curious and alert to the needs of the group and its members. Her commentaries never sounded pat and I much enjoyed, like all the group, the poems and other literary descriptions she employed. We often had a sense of challenge and achievement and all appeared to have a happy time, revelling in the landscape and its awe-inspiring features. However, Gill also enabled the group to be comfortably silent when appropriate--most notably, and movingly, at the Clearance Villages on our final full day together. The choice of hotels and their locations was just right. The daily format of travel, walk and refreshment worked very well. I even managed, after a fashion, to adapt to dining early, shod and largely unwashed--the wish of the majority of our group. It did however leave good long evenings to take the water of life! See my earlier comments as well as these: Gill was just so exceptional--she more than met our expectations. From sharing beautiful poems, to telling engaging stories, and sharing some of her own life experiences, I felt that she was more of a fellow traveler than our guide. Her sense of humor is delightful. Her sensing of unique needs and then finding ways to meet them was appreciated. We were a very diverse group and yet, she made sure that the trip worked for each of us. The trip was a bit highly structured, but she made it possible for some of us to move outside of the structure so we could maintain our personal grounding--or at least that's how it felt to me. I think she has found her calling and I hope she continues to provide her mountaineering leadership for many years to come. Gill was simply fantastic. Her passion for Scotland and her knowledge was evident in everything she planned. She tailored the hikes for the group, had amazing spots found for lunches and breaks. I would highly recommend her for any trip!!! Please see my previous comments regarding our guide Gill. Gill was fabulous. She has a great reading voice and I enjoyed the poems and stories. I learned a lot from her about Scotland, flora and fauna and history of the country. She had a lending library of books and I appreciated that. If I lived near her, we would be best friends. She is all heart! Gillian was knowledgeable and patient with our many questions. She's a gem and wonderfully charming. Jillian was an excellent guide full of information and she was kind and helpful especially to those who needed more help. I was astounded by the way Gill went about her job. Lots of little touches, from reading her favorite poems to researching a question one of us may have had. Also, it isn't easy managing the different abilities and tastes of a group, but Gill's sensitivity, flexibility, and fairness helped keep everyone happy. see previous comments about our leader. I loved all the varied scenery of the trip. No two hikes were the same. And I loved the remoteness of the Hebrides. see my earlier comments. Jill was over the top excellent. Gill very quickly had the group figured out in terms of hiking ability and individual interests. Excellent job. Gill was one of the best guides we've ever had. Not only was she prepared and a fount of information, she was attentive to the group. She was a great communicator and always ready with a "plan B" if needed. Gill was pleasant and professional and seemed very aware of the enthusiasms and limits of our group. Jane Sanderson and Gill were delightful and accommodating. Since my husband is a little hard of hearing and a bit stiff in the knees. Jane was courteous to allow us a few rest stops and quieter places along our journey, showing us points of interest we would have never known existed. Gill was equally spectacular, picking up on our passion for birding, guiding us on even hikes that would permit us to see the most variety of species. She taught us much about the landscape. Fortune favored us by encountering a throng of deer, large bucks, sitting in a field. We shared a common passion and forged an easy camaraderie that made our two days with Gill incredible! Gill's daily reading of poems by Scottish authors made the experience of the beautiful landscape and nature even more impressive. She was a wonderful guide, thanks a lot! Rob Roy: A Crook or a Hero? Make your mind up by walking the Rob Roy Way.